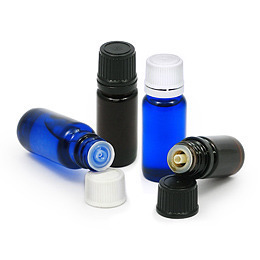 Aromatic essential oil blends, perfect for use in an oil burner or mixing with base/carrier oil to create the perfect massage oil or body oil. 10ml capacity. Standard Fragrances: relaxation, sensual, travel, inspirational, invigorating, mental clarity, romance, energise and wellbeing. Bottle Colours: cobalt blue, amber / Cap Colours: white, black.